Nite Owl Creates: August California Pinterest Party! 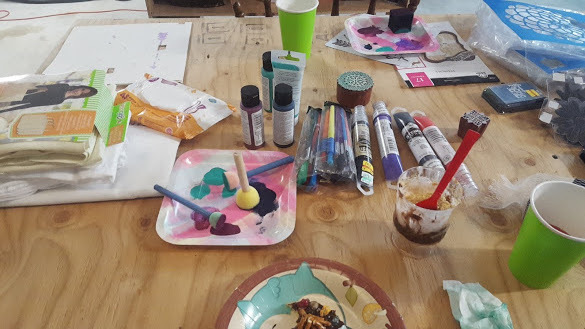 In August I did the Camping & S'mores theme Pinterest Party in Ridgecrest and it was fun to host it in the she-shed again. I tried not to get too crazy on the food but here is one of the treats/crafts. I made sugar cookies and we used chocolate frosting, candy rocks and pretzels to make campfire cookies. This is something we did at the Utah party and they turned out so cute! Tony helped me make some punch and pudding cups which were layered graham crackers, chocolate pudding and marshmallow, topped with graham cracker crumbs. Tasty! Huge thanks again to Winco for providing bulk items! I was able to get a variety of flavored gummy bears, Swedish fish, goldfish and multi-colored marshmallows for great prices. All camping related! I stenciled these cute owls on a dish towel with fabric paint. So cute! Unfortunately this party was not well attended even though I had 4 confirmed RSVP's. Out of those 4 only 1 came. I am so glad she did but a lot of supplies went unused since it was just the two of us. I am hoping the October Pinterest party will be better attendee wise! 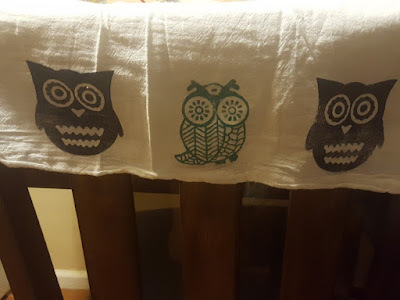 New Cricut Favorites & Free Shipping!